I blended three Distress Ink colors (Antique Linen, Shaded Lilac, Spun Sugar) over the stencil and let them dry. After I was sure the piece was dry, I carefully placed the stencil over the images exactly, and spread translucent embossing paste over the stencil. Now all of the shells are shaded, raised and shiny. We spent last week at the beach. I already miss the sand, surf & shells! Everything is unpacked & put away, and I am all caught up on the laundry. Back to reality – Mom fell again while I was gone and fractured her arm. Does anyone know where I can find a bubble wrap suit?? Supplies: Stamp – My Favorite Things, paper – Curious Metallics Gold Leaf, Neenah Classic Crest Solar White, Stampin’ Up! Pink Pirouette, Wisteria Wonder, inks – Tim Holtz/Ranger Distress Ink Antique Linen, Shaded Lilac, Spun Sugar, dies – My Favorite Things, stencil – Newton’s Nook, embossing paste – Dreamweaver Studio 490 Wendy Vecchi translucent, embossing powder – Stampendous Detail Gold, gold cord – PaperMart. 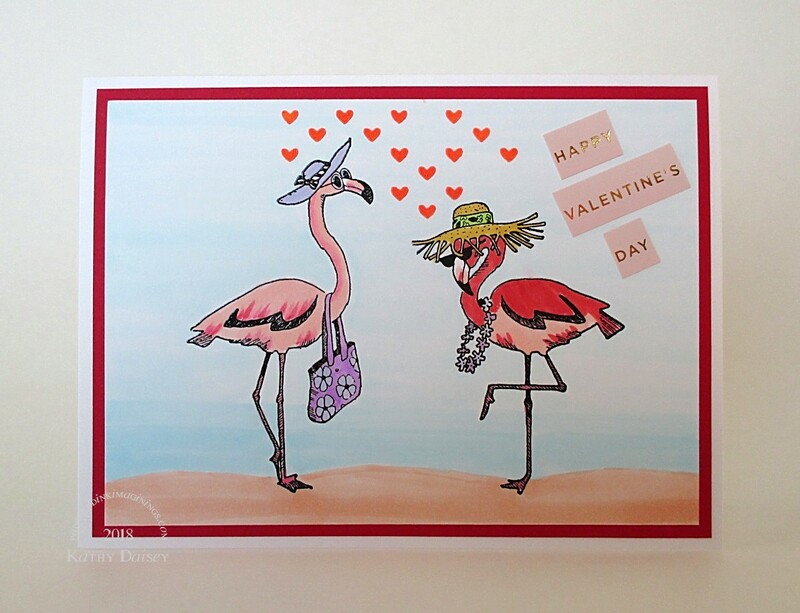 Categories: card, caring, thinking of you | Tags: card, Curious Metallic, Dreamweaver, My Favorite Things, Neenah, Newton's Nook, Paper Mart, Ranger, Stampendous, Stampin' Up!, Studio 490, Tim Holtz, Wendy Vecchi | Permalink. OOPS! Guess who forgot to schedule a post for today! This is for my goofy parents. I think the flamingo on the right (Dad!) came out a little dark, but I was not willing to scrap the card over me not having the correct marker color. For the hearts, I mixed a few drops of Real Red inker with embossing paste, and applied over a tiny heart stencil. Supplies: Stamps – Inkadinkado, paper – Neenah Classic Crest Solar White, Stampin’ Up! Real Red, inks – Copic B0000, B00, BV01, E11, R11, R24, RV13, V04, Y26, YG23, Stampin’ Up! Real Red, VersaFine Onyx Black, stencil – Simon Says Stamp, embossing paste – Dreamweaver, sentiment sticker – Crate Paper (from the SSS February 2016 Card Kit), embossing powder – Filigree Fine Art Powder clear. 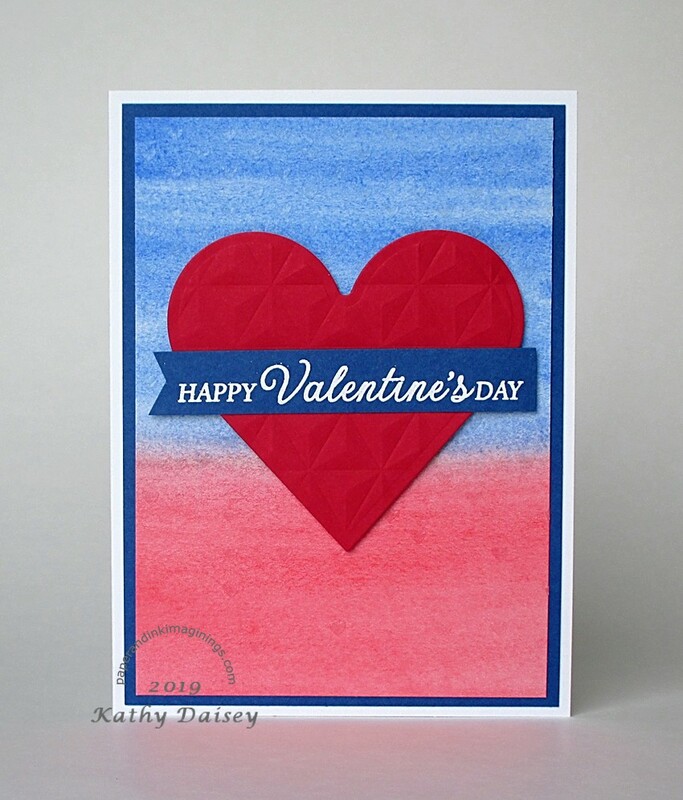 Categories: card, Valentine's Day | Tags: card, Copics, Crate Paper, Dreamweaver, Inkadinkado, Neenah, Simon Says Stamp, Stampin' Up!, Tsukineko, VersaFine | Permalink. I used embossing paste with the Hero Arts Wave stencil on royal blue cardstock, thinking I could pair it with one of the sailboat stamps I have. Well, that may have worked FINE, if I didn’t make the whole page waves…with the whole page as waves, it really looked like I was trying to create my own version of “The Perfect Storm”. So, for today, an abstract background birthday card! You get to pick the background you want to see. Supplies: Stamp – Papertrey Ink, paper – Gmund Royal, Neenah Classic Crest Solar White, Stampin’ Up! Tempting Turquoise, ink – VersaFine Onyx Black, dies – Lawn Fawn, stencil – Hero Arts, embossing paste – Dreamweaver, embossing powder – Filigree Fine Art Powder clear. 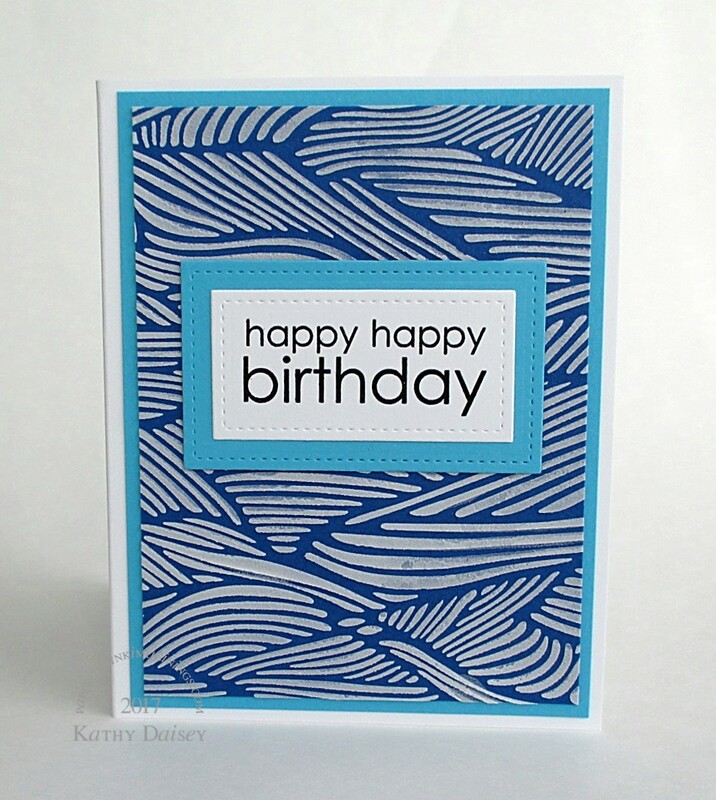 Categories: birthday, card | Tags: card, Dreamweaver, Gmund, Hero Arts, Lawn Fawn, Neenah, Papertrey Ink, Stampin' Up!, Tsukineko, VersaFine | Permalink. I am still playing with embossing paste here. For this background, I mixed a little bit of Almost Amethyst ink into the clear embossing paste before spreading it across the stencil. I die cut a flower out of green, and used the “petals” for leaves. Supplies: Stamp – Papertrey Ink, paper – Neenah Classic Crest Solar White, Poptone Sour Apple, Stampin’ Up! 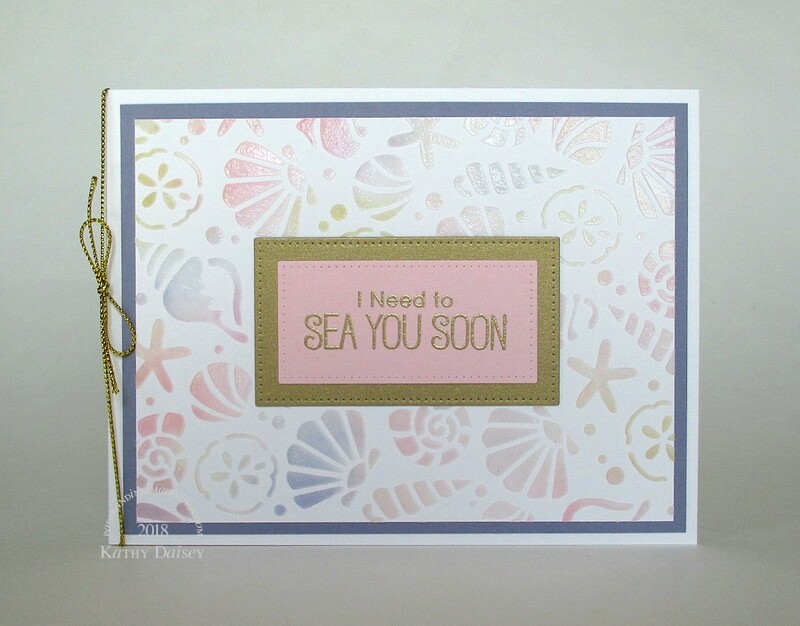 Barely Banana (retired), Bashful Blue (retired), inks – Stampin’ Up! Almost Amethyst (retired), VersaFine Onyx Black, dies – Lawn Fawn (stitched rectangles), Provo Craft (flower), stencil – Neat & Tangled, embossing paste – Dreamweaver/Wendy Vecchi/Studio 490 clear, embossing powder – Ranger Silver Pearl. 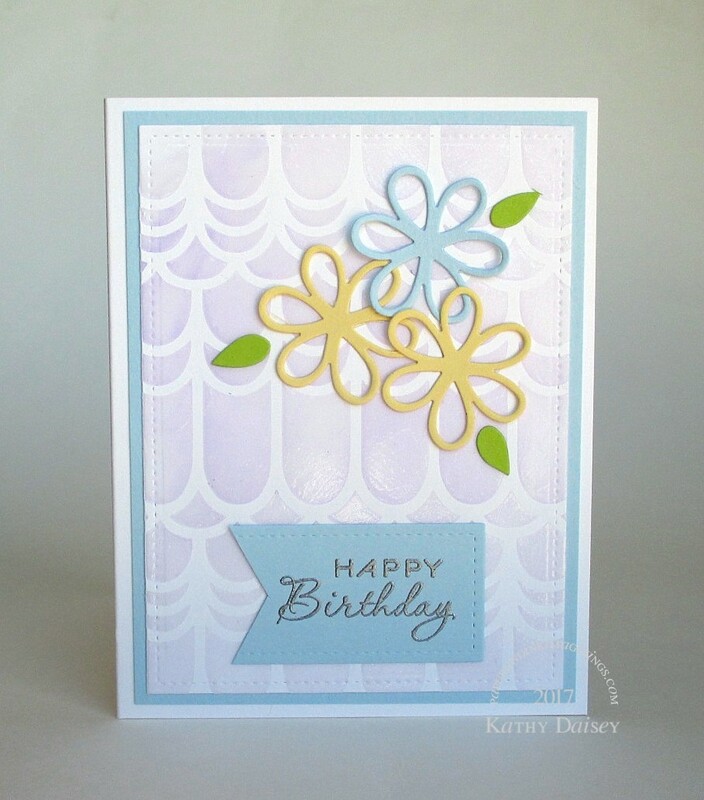 Categories: birthday, card | Tags: card, Dreamweaver, Lawn Fawn, Neat & Tangled, Neenah, Papertrey Ink, Poptone, Provo Craft, Ranger, Stampin' Up!, Studio 490, Tsukineko, VersaFine, Wendy Vecchi | Permalink. Last week, Ellen Hutson’s blog, The Classroom, was featuring Tonic Nuvo Embellishment Mousses. I have none of these mousses. They do look lovely, fun to play with. I really don’t know how often I would use them, and knowing that, how in goodness sakes would I choose which ONE of the 24 colors to buy??? Pink Flambe because hot pink is my favorite color? Or Aquamarine or Powder Blue for the sky/ocean possibilities? In reality, if I do eventually splurge (it is not in the budget for the foreseeable future!) on ONE, I would probably get Pure Platinum, because who can’t use a neutral metallic. I have a two embossing pastes (clear, white) by Dreamweaver, and these can be colored by adding ink before spreading, and I can potentially sprinkle glitter on top after spreading (before it dries). Today, I just spread the clear over a floral stencil. This is a card for my Mom. Supplies: Stamp – Clearly Besotted, paper – Neenah Classic Crest Solar White, Stampin’ Up! 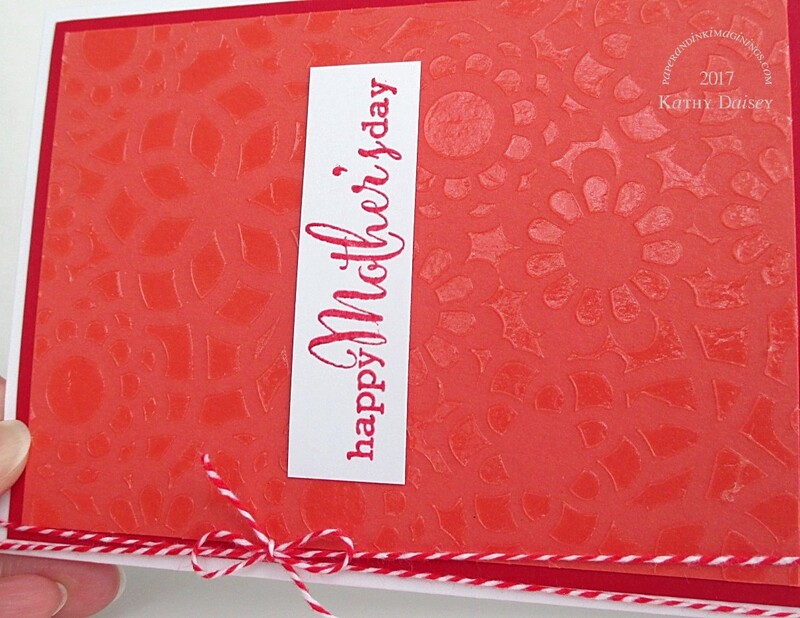 Calypso Coral, Real Red, ink – VersaFine Satin Red, stencil – Heidi Swapp, embossing paste – Dreamweaver/Studio 490/Wendy Vecchi translucent, embossing powder – Filigree Fine Art Powder clear, twine – MarkerPop. 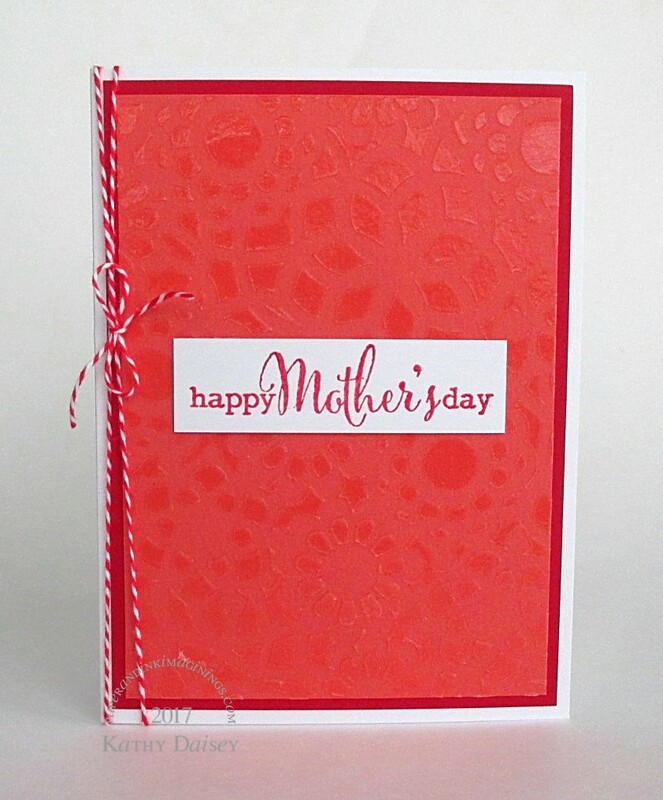 Categories: card, Mother's Day | Tags: card, Dreamweaver, Heidi Swapp, MarkerPOP, Neenah, Stampin' Up!, Studio 490, Tsukineko, VersaFine, Wendy Vecchi | Permalink. I went looking early (6:00 am, EST) for challenges, and nothing had been posted yet. Then, I got working on my own things. I need to go back and look at company blogs for challenges. It is rainy and gray here this morning, so I went with that theme. 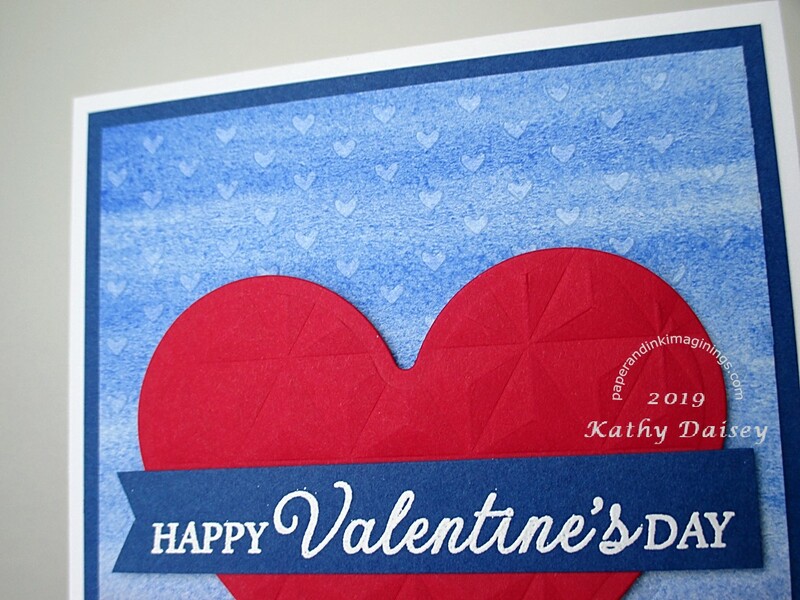 I blended a circle of blue onto gray cardstock, then used a stencil to add falling hearts (rain) with translucent embossing paste. Once that was dry, I mounted the log, the fox, and the sentiment. 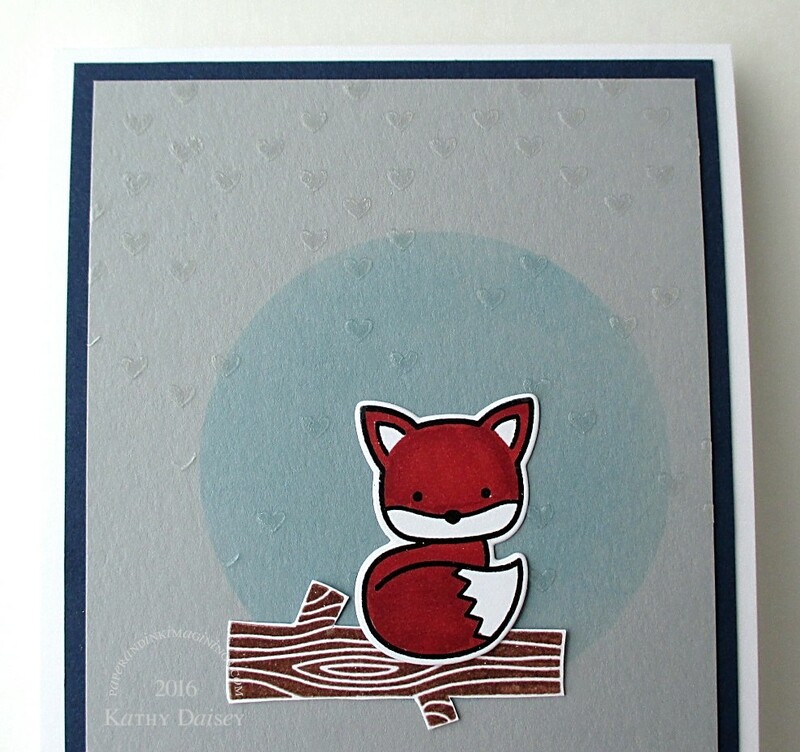 Supplies: Stamps – Lawn Fawn, The Cat’s Pajamas, paper – Neenah Classic Crest Solar White, Stampin’ Up! Night of Navy, Smoky Slate, inks – Copic E19, Tim Holtz/Ranger Distress Ink Tumbled Glass, VersaFine Onyx Black, Vintage Sepia, stencil – Simon Says Stamp, die – Lawn Fawn, embossing paste – Dreamweaver. 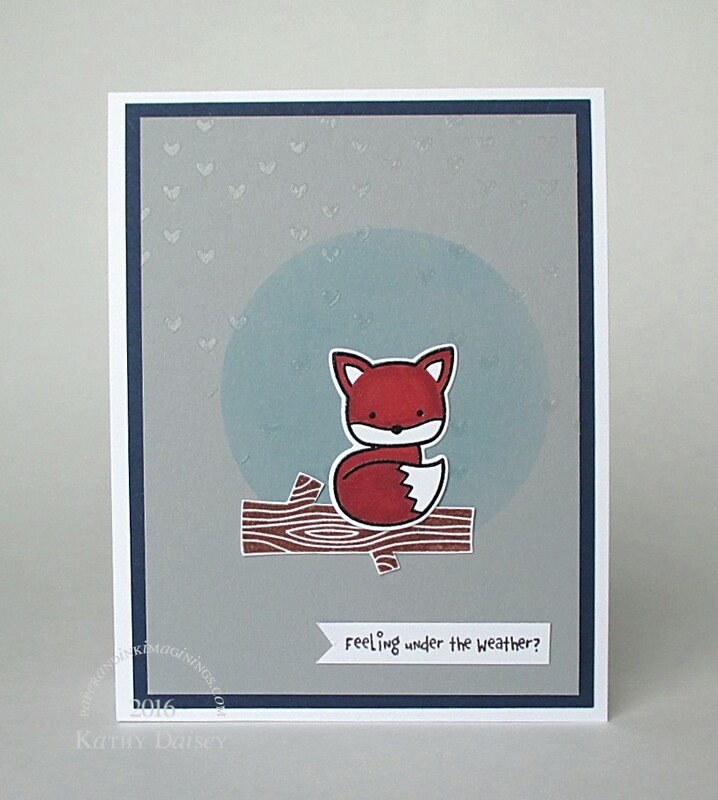 Categories: card, get well | Tags: card, Copics, Dreamweaver, Lawn Fawn, Neenah, Ranger, Stampin' Up!, The Cat's Pajamas, Tim Holtz, Tsukineko, VersaFine | Permalink.